NEWS REPORT: Over 22.000 fans took part in the vote of the biggest stars of the season. Europe’s handball fans have made their choice. 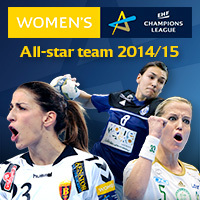 More than 22,000 people participated in the online poll for a Women’s EHF Champions League All-star team – an increase of more than 20 per cent compared to last year when 18,000 fans participated. And many of the stars selected will take to the court at the 2015 MVM EHF FINAL4. Norwegian side Larvik, who have remained undefeated in their EHF Champions League campaign to date, have the largest representation of all-stars at the Budapest final weekend. Their goalkeeper, Dane Sandra Toft, received the majority of votes (35.8%/8119 votes) and so did Nora Mörk (30.9/7012) on the right back and Linn-Kristin Riegelhuth Koren (29.3/6647) on the right wing. WHC Vardar SCBT have one all-star in their ranks, left wing Siraba Dembele (30.2/6851), similar to Buducnost, who bring left back Cristina Neagu (40.8/9273) to the MVM EHF FINAL4. However, the largest representation of all-stars plays for 2014 champions Györi Audi ETO KC, who bowed out at the quarter-finals. Their centre back Aniko Kovacsics (28.2/6406) received the most votes. The Hungarian international is joined by Norwegian line player Heidi Loke, who won her category in the most convincing fashion (57.9/13127), best defender Dorina Korsos (23/5223) and head coach Ambros Martin (32.1/7285). This season was the first time that the season’s best coach and best young player were added to the all-star team. This award went to HCM Baia Mare’s Eliza Iulia Buceschi (24.9/5664).